Ugly holiday sweaters have hit the mainstream in a big way, so it's obviously time for Target to jump in the tinsel and pine needle pile. The thing about doing controversial sweaters is that when you are a small brand making an offensive shirt is not too big of a deal, but when you are Target the rules change. 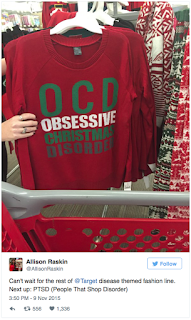 When you are as big as Target, you don't get to make light of mental health issues. But, Target is not backing down and will continue to sell the sweater despite the backlash on social media. Good luck.